Documenting the quest to track down everything written by (and written about) the poet, translator, critic, and radio dramatist, Henry Reed. An obsessive, armchair attempt to assemble a comprehensive bibliography, not just for the work of a poet, but for his entire life. I Capture the Castle: A girl and her family struggle to make ends meet in an old English castle. Dusty Answer: Young, privileged, earnest Judith falls in love with the family next door. The Heat of the Day: In wartime London, a woman finds herself caught between two men. 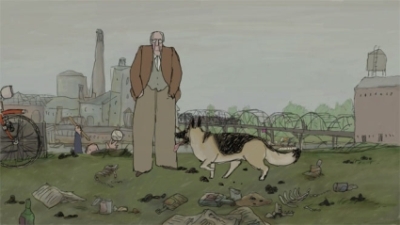 A full-length animated version of J.R. Ackerley's memoir, My Dog Tulip, is set to premiere this May at the Cannes Film Festival. Directed (and animated) by Paul Fierlinger, the film is voiced by stars Christopher Plummer, Lynn Redgrave, Brian Murray, and Isabella Rossellini. There are several clips to watch, on the movie's website. Joe Ackerley was the longtime editor of the BBC's Listener magazine. My Dog Tulip (Google Books preview) tells the story of his sixteen-year relationship with Queenie, his cherished German shepherd. Ackerley and Henry Reed were close friends, and the two were frequent dinner companions in London. My Dog Tulip, in fact, owes its title to their friendship. In his doting 1989 biography, Ackerley: A Life, Peter Parker writes that "Reed had pointed out that Queenie's name was something of a drawback and likely to arouse titters amongst the literati" (p. 311). Ackerley was openly gay most of his life, but he nonetheless eventually settled on a pseudonym for his beloved Queenie. You smell my arse, I'll smell yours. Now that I look, however, I don't see the film listed in Cannes' official selection. I hope that doesn't mean we won't be seeing it, soon. 1524. Reed, Henry. Letters to Graham Greene, 1947-1948. Graham Greene Papers, 1807-1999. Boston College, John J. Burns Library, Archives and Manuscripts Department, MS.1995.003. Chestnut Hill, MA. Letters from Reed to Graham Greene, including one from December, 1947 Reed included in an inscribed copy of A Map of Verona (1947). What else should I call the tale of how Henry Reed almost became a scriptwriter for a 1970s biopic on King Abdul Aziz Al Saud? It's a strange story of anonymous sheikhs, the clash of egos in the film industry, disappearing money, and mistaken identity. In 1975, the director Joseph Losey was approached with an offer to make a feature film about the life of Ibn Sa'ud, the first ruler of Saudi Arabia. Funding for the project was to come from an anonymous source, negotiating through a firm of London solicitors. Now a fatal row blew up. Patricia Losey had been translating Solinas's pages from the Italian as they arrived. Barbara Bray, who didn't appreciate Losey's habit of 'smuggling' his wife in to the work she herself was engaged on, suggested that the script should be translated into English by the poet and radio playwright (Prix Italia, 1951) Henry Reed, who was also the translator of Leopardi and Ugo Betti. The solicitor Peter Stone duly informed Losey that his clients wished to engage 'a first-class literary translator...' Losey was furious: 'I was amazed and appalled at the brutality of your libel by implication of Patricia's work...' To make matters worse Losey persistently referred to Henry Reed as 'Herbert Reed', i.e. the art critic, Sir Herbert Read. Having read 'Herbert Reed's' translation, he declared it inferior to Patricia's: 'I cannot begin to describe to you my rage and perplexity... [your] insensitivity and discourtesy... after Don Giovanni I am quite sure that Patricia's name will be far more known to the mass audiences that Herbert Reed's [sic].' Worse was to come: the principals put the entire project, plus finance, in the hands of London-based Palestinian entrepreneur Naim Atallah, who promptly dropped Losey. I was unsure how Barbara Bray might have known Reed, apart from his translations. Then I came across this Wikipedia stub. Bray had been a script editor at the BBC in the 1950s, until she became involved with the playwright Samuel Beckett and moved to Paris in 1961, where she became a well-respected translator, herself. Ibn Saud was never made, and Solinas's script remained unpublished until after his death in 1982. 1523. Reed, Henry. "Simenon's Saga." Review of Pedigree by Georges Simenon, translated by Robert Baldick. Sunday Telegraph (London), 12 August 1962, 7. Reed calls Pedigree a work for the "very serious Simenon student only," and disagrees with the translator's choice to put the novel into the past tense. Description: We see b/w stills of Birmingham Snow Hill railway station and then David Lodge standing on the platform of the now derelict station (Snow Hill to Paddington was the main route to London prior to the electrification of the New Street to Euston route in 1966). We also see b/w archive of the interior of Snow Hill station (ATV news). Throughout the programme there are several stills showing Birmingham circa 1930s and Birmingham University. Lodge is a writer and lecturer at Birmingham University presents the film which examines the Birmingham literary scene of the 1930s. A group of writers, many with connections to the university, worked away from the literary world of London. The so called Birmingham Group are discussed and illustrated with b/w stills: Walter Allen (1911 - 1995); John Hampson (1901 - 1955); Leslie Halward (1905 - 1976), Walter Brierley (1900 - 1967); and Peter Chamberlain (? - ?). Also referred to is the poet W. H. Auden (1907 - 1973); the poet and lecturer Louis MacNeice (1907 - 1963) as well as the lecturers E. R. Dodd and Philip Sergeant Florence. We see the exterior of Birmingham Central Library which is the former site of the Faculty of Arts of Birmingham University. Lodge interviews Walter Allen who reminisces about the Birmingham literary scene of the 1930s and R. D. Smith (Reggie Smith - a former BBC radio producer who died in 1985) who was a contemporary of the Birmingham Group. We see Angelsey Street and Wills Street in the Lozells area of Birmingham where both Allen and Smith were born. A reader (Michael Cadman) recites poetry written by MacNeice; a section of a Halward novel; and a poem written by Auden beginning with the lines "As I walked out one evening walking down Bristol Street" which supplies this film with a title. We also see the exterior and interior of Highfields, a house at Selly Park owned by Philip Sergeant Florence where MacNeice lodged. It's difficult to tell from the wording in the film's description, but it looks like not only does Lodge interview Walter Allen, but also R.D. "Reggie" Smith. Is that how you read it? I'm hardly shocked by the lack of mention of Reed, but I'd be surprised if his name doesn't come up somewhere in the film as being a contemporary of Allen's and Smith's, on the fringes of the Birmingham Group. It would be just like Reed to end up on the cutting room floor, though. MACE provides video clips of many of the films in its collections (but unfortunately, not for "Bristol Street.") For instance, here are the Willson family's home movies, taken in Handsworth, Birmingham, between 1939 and 1941. 1522. Reed, Henry. "Hardy's Secret Self-Portrait." Review of The Life of Thomas Hardy, by Florence Emily Hardy. Sunday Telegraph (London), 25 March 1962, 6. Reed says this disguised autobiography is a "ramshackle work," but is still "packed with a miscellany of information not available elsewhere, and readers who care for Hardy will find it everywhere endearing, engaging, and full of his characteristic humour." Reed, Henry (1914-1986). Born: Birmingham, England, 22 February 1914; died: London, 8 December 1986. Education: MA, University of Birmingham, 1936. Served: RAOC, 1941-42; Foreign Office, Bletchley Park, 1942-1945. Freelance writer: BBC Features Department, 1945-1980. Have You Seen This Painting?